It’s that wonderful, magical time of year in Michigan, when snow nestles the campus in a winter wonderland. Students are getting excited about going home for the holidays and spending time with family. Also upcoming is the sometimes stressed-filled finals week. M|Gift Packages can come to the rescue to help ease study anxiety. 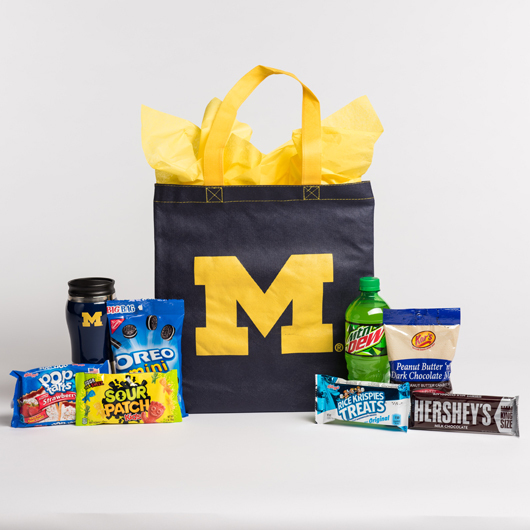 Several options are available to send your student a virtual hug along with snacks, drinks, U-M merchandise, and the message that you’re thinking of them. Study Break: a big selection of goodies to help take the stress out of exams. The basket is filled with soda, crunchy snacks, assorted cookies and sweets, Pop Tarts, and a U-M travel mug. To Your Health: Help keep your student healthy during this busy time with a collection that includes fresh fruit, trail mix, oatmeal, Fig Newtons, an energy bar, bottled water, a variety of sweet and salty snacks, and a reusable water bottle. M|Gift Packages are also available with themes such as Get Well Soon, Movie Night, and Good for U. Upcoming packages include themed Valentine’s Day baskets. 13 Residential Community Centers (for a $10 delivery charge). Proceeds from M|Gift Packages support U-M student programs and campus facilities.